We are SO excited to finally share this GIVEAWAY with you guys! Nothing makes us happier than being able to give something back for all your support! We were approached by We Are Knitters a while ago, asking if we were interested in trying some of their yarn whilst designing our patterns. The timing couldn't have been any better as Dennis was stuck with his "Point Made" scarf, not finding the right yarn for his pattern. It had to be bright and chunky, but the colours available here in Germany just weren't cutting it. Dennis requested their "Petite Wool" in Deep Turquoise, as Turquoise is his all time favourite colour. You know how the colours sometimes look super saturated on photos, but once you receive it, it's not nearly as bright? Well this was quite the opposite. It couldn't have been more true to the photos! Insanely gorgeous, bright, saturated Turquoise. It was soft, it was squishy, it was chunky, it was delicious. It was such a pleasure opening the box, and finding these gorgeous skeins of yarn inside! Once the pattern was done, we had some more contact with We Are Knitters, and they suggested they would gladly sponsor a giveaway as a collaboration. We would supply the pattern and they would supply the yarn. Now isn't that exciting??? The pattern uses up 4 skeins of The Petite Wool (100 grams each) which is a 100% Peruvian Highland Wool! Doesn't that sound crazy exciting??? 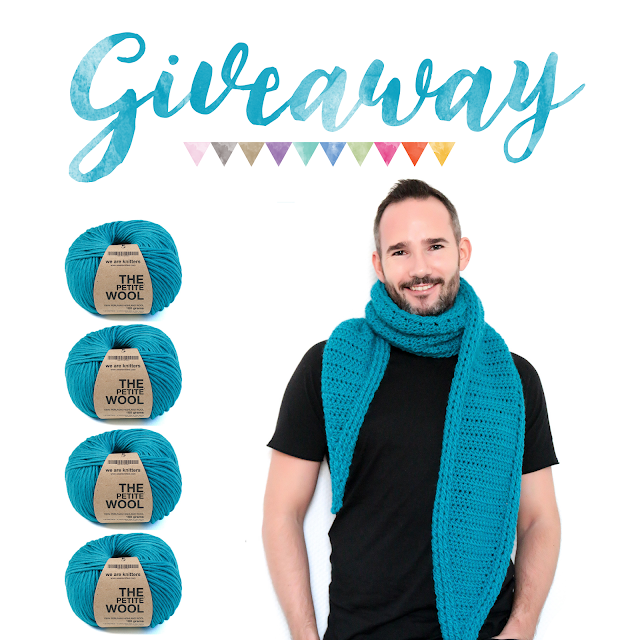 You will win 4 skeins of The Petite Wool from We Are Knitters in the color of your choice as well as the Point Made Scarf Pattern which includes a written pattern as well as a video tutorial! You can do with the yarn however you please and are obviously not restricted to only use it for this pattern! The rules are few, but important to us, as we're trying to get our name out there as a starting small business. We truly hope you understand why we have these rules. 2. Join our Boys & Bunting Crochet Group on Facebook (that's not our FB Business Page). 3. Comment on this blogpost with your name and country of residence. As the prize will be shipped to you by We Are Knitters, we are limited by their shipping rules. We Are Knitters ship anywhere in the Continental US, Canada, the Nordic countries (except Iceland) and the EU. That still covers a very wide amount of our following, but sadly does exclude some of you as well. There will be more Giveaways coming in the near future (a very exciting one that I can't even handle) and they will be shipped fully international! You will have till Wednesday the 7th of December at Midnight (EST) to enter! On Thursday the 8th we will pick a lucky winner. This will be done completely randomly. The country you're living in does not influence anything. No worries! We hope you'll enjoy the excitement that comes with a giveaway like this, and we can't wait to congratulate someone with this crazy exciting prize! Rosanne van the Peppel,the Netherlands. I live in Isle of Wight, Virginia haha all the names around here are English or Indian. Ohmy. I would love this and in the same color....turquoise is my all time favorite. Oohh I would love this. And in the same beautiful turquoise. My all time favorite color. This is so exciting! My name is Megan and I live in the U.S.
Love you guys! Thank you for doing this cool giveaway. This is so great! Thanks a mill. Thank you for this great giveaway! I am Morana Sunara from Solin, Croatia. Ich würde mich sehr über das Muster und die Wolle freuen. Sara here! I'm from Saskatchewan, Canada! I am just obsessed with the group on FB and with you two! Jo from UK, lovely work. Thank you for the opportunity! I live in California, USA. I'm glad to find you via Instagram. I post some pics at the fb group the other day. Much charisma! Ileah- from New Mexico, temporarily in SK. I'm a sucker for a vibrant turquoise as well. Looks great on you! Kath McLeod, Scotland apologies if this has posted twice. I just got into learning how to crochet and your instagram is pretty cool! Your blog is pretty neat too; I most likely will try out a pattern once my school has break! Hello! What a grand giveaway. I love the colours of wool they have. I already am a subscriber of your YouTube channel, and have requested to join the Facebook group. Thanks for having this giveaway. Hope you both have a lovely day! I forgot to tell you I live in the USA! Thanks for sharing these crochet projects. hi from Caroline in Ireland! Great combination! Love the color and the yarn �� Here's some 'cross fingers' from Izaskun, Spain! Ginny, from Boston, MA, USA. I have seen weareknitters.com yarn.So many fiber types and the colors Kits too.So nice to have a chance to win. Jordan Zangri Virginia, USA! So excited! I'm in the US 😊 Thank you! Oh Yes! Love this giveaway! And I'm just on time before it closes. My name; Lisenka, country: The Netherlands.